This backbone resource for in-house counsel and corporate law departments covers employment agreements and executive compensation, managing complex litigation and litigation budgeting, implementing internal insider trading controls, alternative dispute resolution formats, intellectual property, noncompetition agreements, compliance and reporting obligations. By Michael A. Epstein and Dennis J. Block. 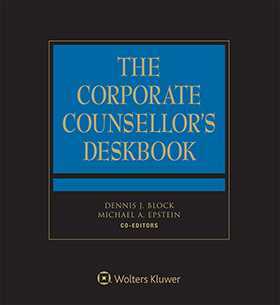 The Fifth Edition of The Corporate Counsellor's Deskbook offers insightful analysis of the key areas of the law of critical interest to in-house counsel and corporate law departments, as well as outside firms and attorneys who represent corporate clients on a regular basis. The process of going public and the reporting obligations of publicly-held corporations.